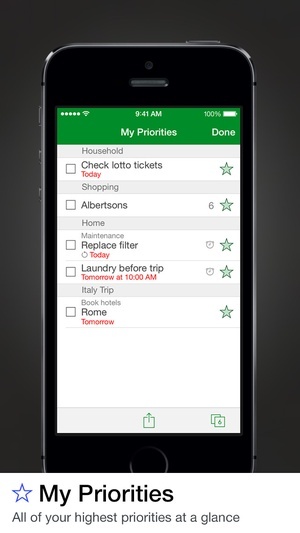 Enjoy effortless and intuitive task management with Priorities™, and you’ll never dread your todo list again! The innovative use of pages takes the “task” out of task management, and the attractive themes add a little fun while you’re at it. Throw out your pen and paper, because with Priorities, everything you need is literally at your fingertips. Quickly scan through your pages of todos with the touch of a finger and add new todos with the ease of a single button. Add alerts, due dates, due times, and notes right from the Add screen. Create and save templates to use again and again. Use the syncing feature to backup your data and to share pages with a family member, a friend or a coworker. 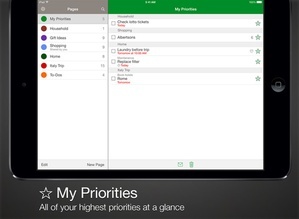 Go to the mypriorities.com website to edit your pages and tasks on the web. 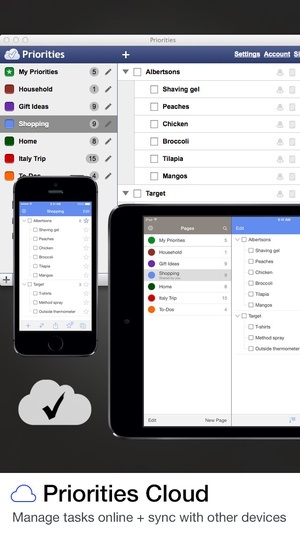 Priorities is a musthave for anyone who wants to stay organized! Priorities is fully equipped to do the work for you. Just take a look at the great features it offers Universal App One app optimized for your iPhone, iPad, and iPod touch. 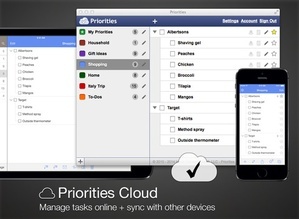 Priorities Online Manage your tasks online at https//mypriorities.com. 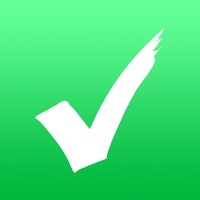 Fast Add Quickly add tasks or lists of items with a touch of a finger. Due Dates, Due Times & Notes Assign a due date, a due time, and record notes for a task or item. Priorities Star everything that is highpriority and view them ataglance in your Priorities page. Repeating Tasks Schedule tasks to repeat every day, every 3 days, every Tuesday, every 3rd Sunday of the month, 2 weeks after you've completed the current task… or whenever you want! Flexible recurrence options make customization a snap. 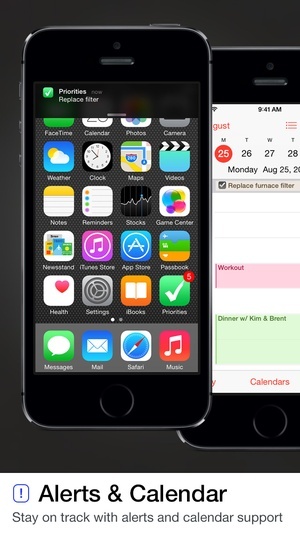 Reminders See a badge count of your starred items on the Priorities home screen icon, and set a reminder time for a popup and/or sound alert for important items. 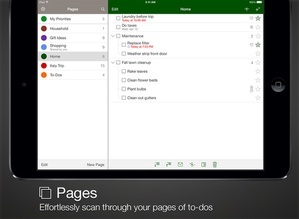 Multitiered task management Create pages, lists with subitems, and tasks with subtasks to make organizing easier. 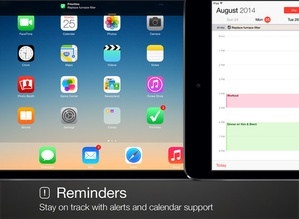 Calendar Integration View all your items with due dates in your calendar (iOS 4 w/ multitasking required). Templates Save a page as a template if you want to use it again later. This is a great feature for grocery shopping and travel! 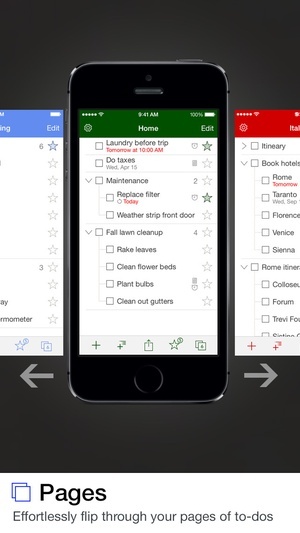 Multiple Pages Create custom, colorcoded pages to keep track of all areas of your busy life. Tap or swipe to review them ataglance. Sync Use our secure server to sync for backup and to sync between multiple devices. Page Sharing Create a sync account and assign pages to be shared with others. 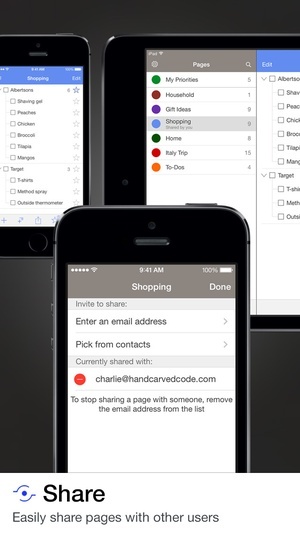 This is a great feature for sharing a shopping list with a spouse or sharing todos with colleagues! Other features Search, Sort, Passcode Lock, builtin Hot Links for phone numbers, email addresses and websites, and more. Visit our web site to find out more. We strive to create the highestquality software possible so that our customers have a positive and enjoyable experience. If you would like to tell us about a problem, offer a suggestion, or send us feedback, we would love to hear from you and will make every effort to respond promptly. Email us at support@handcarvedcode.com. Thank you and enjoy! Check these links to find your download for Priorities for & iOS or for your device iPod TouchiPadiPhone. The app Priorities is compatible with te following devices.